Find the perfect red lipstick for your skin tone. I love red lipstick. With the exception of a few rare circumstances it is the only lip colour I wear. 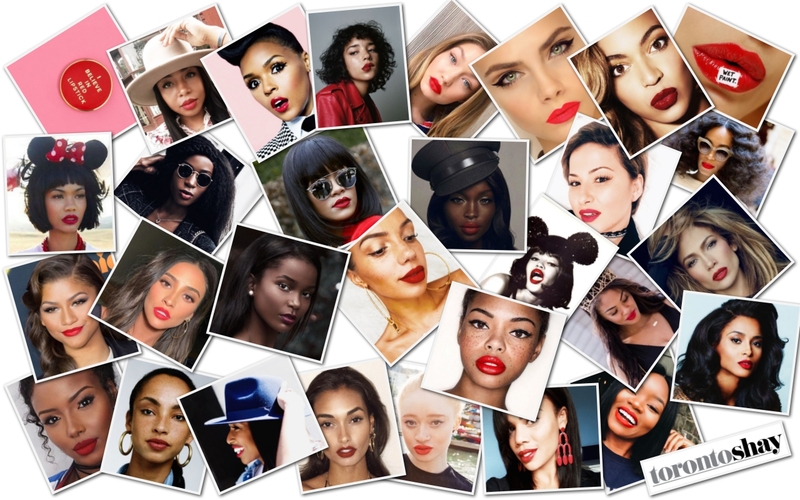 It actually took me a few tries to find the perfect colour for my complexion, so I decided to ask 8 inspirational women (of several shades and tones) what their favourite red lip colour is so you don’t have to go through the trouble. Charmaine A.K.A “Charmsie” Daudu is a DIY style and beauty vlogger who I like to call the Fairy Godmother of Halloween Fabulosity Realness! When October rolls around Charmsie comes up with cute and fab ideas that give everyone LIFE. Charmsie is a Taurus and is based in ATL by way of Toronto and is a new mama to the cutest little boy named Zendé. Her favourite red lippy is “Bawse” liquid lipstick by Smashbox Cosmetics. Lola Plaku is the definition of a BOSS. Rubbing shoulders with Drake, Cardi B and Diddy is just another day on the job for Lola. As an artist management and branding expert, her instagram page reads like a “who’s who” of Hip Hop. When Lola isn’t making major moves for French Montana or Belly, she’s working on giving back through one of her latest ventures “Be A Girl Connected”. Lola’s go-to red is Matte Red Lipstick by Too Faced. The first time that I met Mirian I was immediately taken aback by her striking beauty. At the time, I had no idea who she was. But I knew that I wanted to meet her, so I walked up to her and introduced myself and was welcomed immediately by her warmth and positive vibes. You may recognize Mirian from Alessia Cara’s “Scars to Your Beautiful” video where she bravely shares how the differences that once made her feel insecure later became her greatest STRENGTH. Mirian doesn’t know this but the first time I watched, I cried. And, trust me, you will too. Apart from slaying in campaigns with Uniqlo and Nike, Mirian is founder and CEO of Shop Sororum. Her signature red is “Orange dream” by ELF Cosmetics. Destiney (a Cancer) is EIC of @Momcrushmonday and co-founder of Majoring in Motherhood (a business leadership group for women). And that’s not all, Destiney also runs her daughter’s Girls Empowerment Platform (The Honor Code) and is about to start her own makeup line (appropriately) called Lip Crush Monday! Destiny has been an e-mentour to me since the beginning of the year and I can’t rave enough about how much she has helped me grow and learn in this crazy blogging world that I now live in. Destiney is wearing the red lip colour from her new line. Emilie Mckenzie is an Aries and blogger behind European based Mes-Dames.com. Photos from her destinations are a wanderluster’s dream and her style is equally impeccable. Classic & Chic. I stumbled across Émilie’s instagram page a few years ago and I’ve been a loyal follower ever since. Émilie wears Armani Lip Maestro in shade 400 with the Guerlain Lip Pencil in Rouge No. 21. Besides being a Pisces (the best sign! ), Lola Akinkuowo A.K.A @ThinkPoppy is the head Educator and Bloggerpreneur behind TheBloggerEtiquette.com where you will find all kinds of tips and tricks to help ladies like you and me kill the blogging game. Her free branding guide (that you can get on her Instagram page) has helped me re-align the direction of my blog and I highly recommend it. Lola’s signature red is Cherry Blossom by Coloured Raine. I hope you guys enjoyed this post! Please share your favourite lip colours in the comments below! I love a good red lip! Thanks for the tips. I love this so much! Such a fab post babe, red lipstick is my favorite! This is such a cute post idea!!! I love this list. I actually just bought Bawse Lady because I saw it on Kéla Walker. I may have to check out the others that you listed. I’m still trying to find the best red lip color for me. It’s so hard to narrow it down lol! AHH, I LOVE am a red lip fan!! I love a classic ruby red or the orange red!! I LOVE A GOOD BOLD RED! I love this post girl! I am always searching for the perfect red.